I get email updates from Eric Carle. In the latest email, there was a link to his blog! The blog is really cool, it has artwork and writing, his latest post is about his childhood Christmas memories. 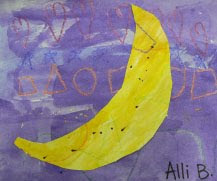 The blog reminded me of the Eric Carle unit I did during student teaching last spring. 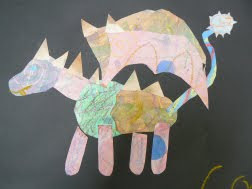 Each grade K-6 did a wax resist painted paper collage project inspired by Eric Carle. 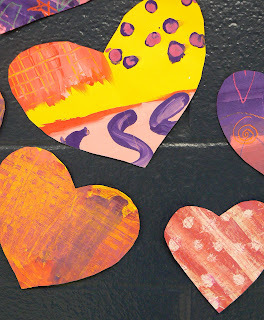 3rd grade students cut hearts from their painted papers (3rd grade did wax resist and tempera with texture combs) which were displayed in the hall for Valentine's day. 4th grade students drew a letter out of a hat and chose a word to illustrate for that letter. 6th grade students were to tell some sort of story with three parts/three illustrations. It could be a song lyric, joke, story, nursery rhyme, or process. I would LOVE to visit the museum! If I ever get the chance to visit MA, I will!